As I watched the MuseumNext tweets roll through this week, it occurred to me that one of the things that draws me to this profession is the optimism and idealism that seem to exist within it. Every conversation, every 140-word tweet, seems to ask how we can encourage innovation, participation and the opening up and expanding of knowledge. When I read blogs from the field, I feel that I read the words of visionaries, explorers and philosophers. Given that we are setting out to conquer previously unexplored territory, this is probably not surprising (nb: I’d be interested in whether some key personality types – maybe adventurers/explorers – are disproportionately found this field… something to consider further). I wonder if this same sense of cooperation and excitement is true across all areas of technological development… the Internet has brought with it so many opportunities for connecting like-minded souls and bringing minds together in conversation that this sense of community and common purpose cannot be unique to this sector. After all, who doesn’t love discovering that they aren’t the only person obsessed with knitting sweaters for their cat?!? In this climate, it truly doesn’t surprise me that now is when the privately-funded space race is taking off. Koven’s Ignite speech likened museum websites to Conestoga wagons in an age of the automobile. Yet in many ways we are still living in technological frontier towns. We don’t have cars yet because we haven’t yet built the paved roads that could accommodate them. 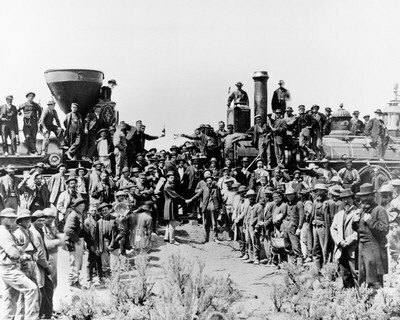 But when I read about the innovations that are already happening in our field, I am sure that it won’t be too long before we have created the equivalent of the transcontinental railroad. People in the field seem willing to share both their successes and their hard-won lessons and there is an almost ennobling sense of purpose in the pursuit of new and better ways forward. Having said that, as exciting as these movements forward are for those of us exploring this undiscovered territory, we have to ensure that we don’t forget to communicate our journey to those back home in the ‘old country’. Being on the precipice of a new and unshaped world might be exciting, but for those who aren’t part of the journey uncertainty breeds fear. It’s no surprise that in many museums, this interactive world of digital technology might cause consternation. Any adventure into undiscovered territory brings with it a sense of risk and fear. And so it is the responsibility of those who are making new paths through the digital wilderness to map those paths, and show the people who will follow that the way ahead is safe. ← Update to: But do I need an iPad? Erik van Tuijn and I had a discussion about this in the Air and Space Museum in DC. Happy as we were to see all these pioneering planes and rockets, we felt like we had missed out on our opportunity to discover. Erik said exactly, “maybe that’s why we do innovation, because it’s one of the few things left to discover.” I do tend to believe that. Yes, me too! Any time I’ve ever done a work personality test, my results are always telling me I’m an explorer/innovator. And I’m sure I’m not the only person in the field who sits at this end of the spectrum. From memory, I think that people with the explorer type personalities are generally underrepresented compared to lots of the other work personality types – but I would guess that there are probably quite a lot of us working in museum tech.